Cold Calm, 60 tablets (Boiron) - Penn Herb Co. Ltd. 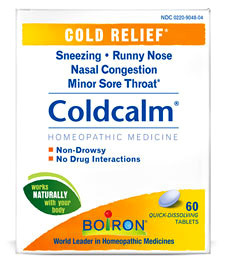 Cold Calm is homeopathic medicine for sneezing, runny nose, nasal congestion, and minor sore throat. Temporarily relieves cold symptoms such as: sneezing, runny nose, nasal congestion, minor sore throat.